Recent arrivals all the way from Peru. Susy Records has released a 3" CDR version of the Alpaca Sports single and I have to say I think that the artwork looks so much more suited to this smaller format. 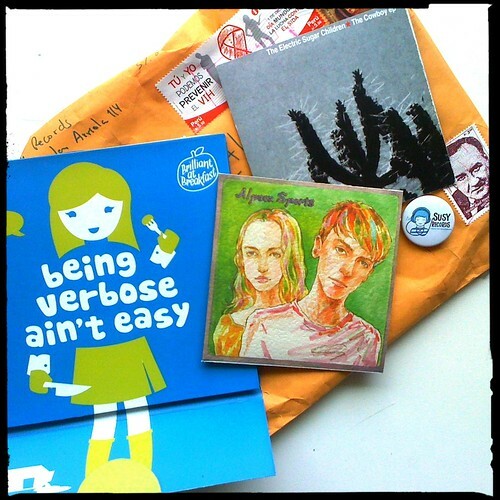 Also in the shot here are an oldish Electric Sugar Children 3" which is similarly fab, and the neatly packaged "Being verbose ain't/is easy" set by Brilliant At Breakfast. Plus a badge. And an envelope. With nice stamps. Of course. Get your Peruvian gems from Susy here.